The concept of a reproduction or transmission rate comes from epidemiology. It is the average number of new infections a person infected with a disease will cause. If this number is over 1 the infected population will grow, if it is below one they will shrink in the long term. It assumes a 0% immunity rate in the general population, meaning everyone exposed to the pathogen will become an infectious case themselves. In memetics and viral marketing this idea is used to indicate the average number of new people that will become “infected” with a meme as a result of a single seed’s expressions of the meme. However biological contagions differ from memetic ones in that individuals typically have a higher level of immunity to them, you may be exposed to hundreds or thousands of memes everyday, but you will assimilate and spread some of them. 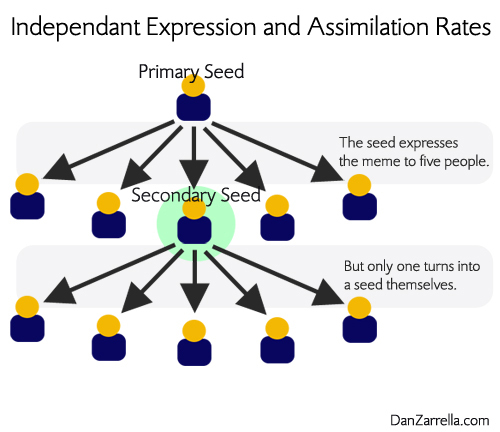 I propose a more useful model is a multivariate transmission rate, that takes into account a number of variables including separate expression rates (the average number of people a seed will expose to the meme) and assimilation rates (the average number of people who, once exposed to the meme will express it to new people themselves). This model provides a more realistic and granular description of the processes at work and allows us to study areas (like multiple exposures) were memetic viruses and biological ones vary, and I’ll get into exactly that in part 2.